The following picture are compliments of Melissa Nesbitt. 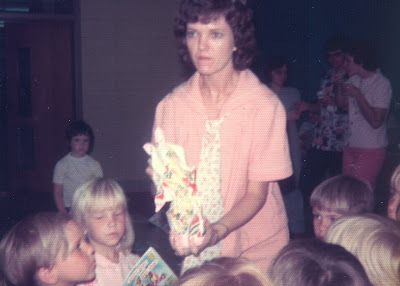 She's been digging through old photo albums and has found a treasure of priceless photos from Mrs. Blackerby's East End Elementary Kindegarten class. We've tried to identify as many as possible. If you see someone we missed, leave a comment. And, as always, you can click on any image to enlarge. 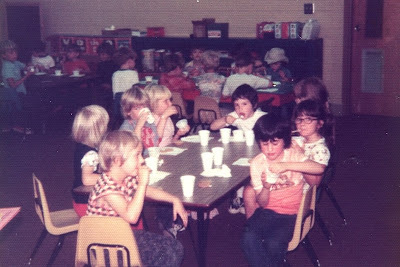 Most of these kids didn't graduate with us, but perhaps you will remember Peggy Godfrey and Angela Dillavou--Angela is holding her ice cream cup in front of her face, Peggy is on Angela's left, and on Angela's right is a girl named Alicia Beavers. And check out the Avocado green kitchen set in the back corner - just like our mothers had! Bryan Clay, Darren Yarborough, Kenny Estell, Joe Perkins and Jerry McElyea. Again, check out the background - you've got to study these photos carefully to fully appreciate the retro-value. There are a couple of cans Playskool blocks - looks like the shaped blocks for building cool castles, and the black canister is the classic, wooden, alphabet blocks. All complete with lead paint, I'd presume. How many of you EEEers learned your ABC's off of that chart posted above the chalkboard?! Here you have Corinna Hartman doing the ring toss. You'll also notice Lisa Bradford, Bryan Clay, Lee Kaufman, Joe Perkins, Shannon Ellington and Mike Wells. Behind them are Jerry McElyea, Kevin Young, Sid Reynolds. 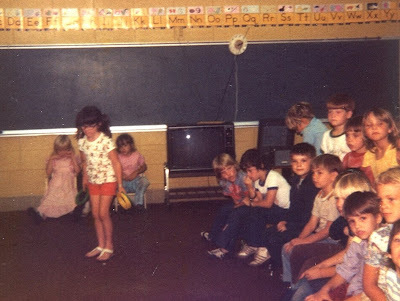 One of the girls sitting under the blackboard might be Loyce Oden. Corinna is probably going first in ring toss because she's in style with those groovy thong-toe sandals. 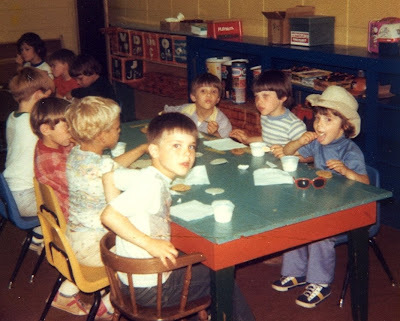 At the "Boys Table" we see Kevin Young, Sid Reynolds, Mike Wells, Lee Kaufman, Shannon Ellington and I think Danny Roberts is next to him. Don't know the kid in the cowboy hat. Way in the back are Bryan Clay, Darren Yarborough and Kenny Estell. What else do you see? 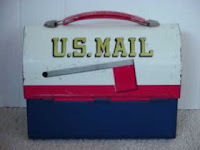 You're getting a good retro-eye if you saw a can of Tinkertoys, but you're really doing good if you discovered the US Mail, mailbox-shaped lunchbox up on the shelf. Say "Hi" to Mr. Zip kids! At the time of this posting, you could grab this very lunch box on Ebay for only $10! 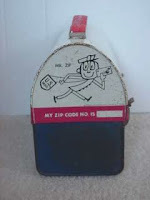 (Plus $10 more for S&H) Does anyone remember if this was your lunchbox or not? Obviously the cameraman moved back a bit to snap a shot of the girls table. We see Melissa Nesbitt, Corinna Hartman, Dana Oates, Lisa Bradford and Barbara Nall. You'll see the boys table in the background and more lunchboxes! When you enlarge the photo, you'll notice that two of the lunch boxes are exactly the same. 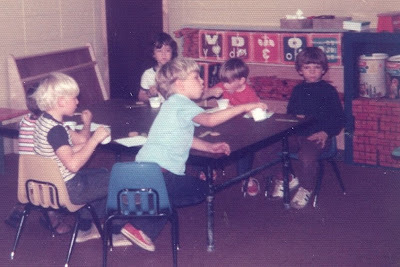 By the way, the kiddies are all eating ice cream out of those small plastic cups with the flat wooden spoons that were like midget tongue depressors. 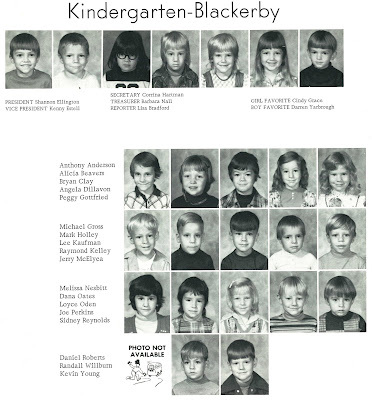 I plan on posting ALL of our Kindergarten class pictures later, but I thought I'd include Mrs. Blackerby's here to help identify everyone. If you click on this pic, you'll get a super-sized image to view. Enjoy and thanks again to Melissa Nesbitt for the photos. I've got a few more from her I'll be posting soon. Those were great! Thanks, Melissa! I wasn't in that class, but WOW, brings back memories! Vic, weren't you in Mrs. Gregory's class across the hall? I was always "scared" of her because she was "old." Seemed like she'd be mean. Our teacher was actually "Miss" Blackerby. 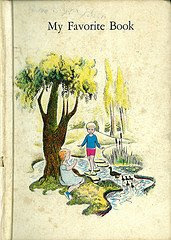 I remember well because I wanted my older brother to marry her so I could have her around all the time--that is until she took up Corinna's and my baby dolls (which we were playing with when we should've been working), and she THREW--actually THREW-- them on top of the stack of cots. How cold and unfeeling to throw my "child" across the room! Oh, what fun kindergarten was! The best part was "chocolate" milk day. I don't remember that we got to have it all that often. Speaking of the lunch boxes, mine was a Disney one. I saw one like it in an "antique" shop a few years back for the whopping price of about $50.00! Nothing beats the smell of a peanut butter and jelly sandwich combined with one of those old metal lunch boxes. And who can forget the grossness of finding that your "Aladdin" thermos had leaked all over creation soaking the said pbj sandwich into a soggy gooshy mess. PS forgot to sign my name on the last comment. The Disney lunch box was mine. 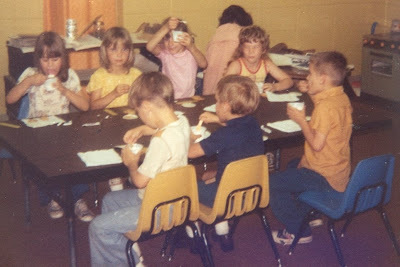 One more word on vintage toys--sorry, this has just become too much fun--did y'all notice the cardboard boxes that looked like large "bricks" in classroom photos? You could build all kinds of houses, bridges etc. out of those. I'm sure they don't make such cool stuff now. Yep, I was in Mrs. Gregory's class and my first day was TRAUMATIC. Mr. Dodson actually carried me around half the day. I FREAKED when my mother walked out of that door! I honestly don't remember much from Kindergarten. But I do remember that we prayed every day. Sad that that is a thing of the past. Vicki, I'd probably have freaked even more if Mr. Dodson were carrying me around all day! I was always scared of him too 'cause he was the PRINCIPAL (you know, the one with the "electric" paddle? I think every principal was rumored to have one of those.) You know, Miss Blackerby's class did not pray every day, but I do remember Mrs. Fox in 1st grade teaching us that the Bible was the best book we could ever read. How true, and how sad so many of our nation's kids don't know that today. No wonder they're killing themselves and each other and their parents and teachers.